On Sunday January 2, 2011, Rev. Tony Ponticello addressed the congregation at the Community Miracles Center in San Francisco, CA. What follows is a lightly edited transcription of that lecture. We as A Course In Miracles students don’t relate to Christmas as necessarily being about Jesus’ birth. We relate to Christmas as the birth of the perfected holy child of God within ourselves: within you, within me, within everyone. Christmas is the time when we celebrate that. We celebrate the perfected holy creation that is inside of us, inside of everyone. If we loose sight of this during the course of the year hopefully, in the days around the holiday season, we remember that this is the reality of everybody. This is a great milestone to achieve. It is no idle or small accomplishment to remember that everybody is the Christ. From this new foundation we launch into a new year where there is a lot for us to accomplish. This is what I think this passage is saying and this is how I like to relate to it. The Course is asking us to accomplish things. It’s January 2nd, as I said, the first Sunday of the second decade of the 21st century. Sometimes there is a little confusion about this because last year was 2010. We’ve already had a year ending with a “one zero.” Now we have a year ending in “one one.” Didn’t it already turn into the second decade last year. Technically, “No.” The first year that Jesus was born is not called year “0.” It’s called year “1.” The last year of the decade is actually when it’s year, “10,” “20,” “30,” or “40.” It’s not until we get to year “11” that we start the new decade, the second decade. It even gets more complicated because we all related to the year 2000 as the start of the 21st century, the new millennium, but actually the year 2000 was the last year of the 20th century and the last year of the old millennium. None of this matters because it’s all incredibly arbitrary, how we look at time, dates, years. Even the fact that we call a specific day “New Year’s Day” is meaningless. It’s always just now. What the hell difference does it make? (laughter) But we like to make it a difference. We use what is called the Gregorian calendar. That was put into place in the year 1582 by Pope Gregory. It corrected what had been in use since 45 years before the birth of Jesus which was called the Julian calendar. The Julian calendar was an amazing achievement for people at the time. The astrologer scientists at that time figured out that there were 365 days in a year. They also figured out that every four years they seemed to need an extra day. Isn’t that amazing! Even way back 45 years before the birth of Jesus they knew that there were 365 in a year and that every forth year they had to have a leap year’s day. That’s when leap years were added. However in 1582, it was realized that somehow the calendar was getting off. The equinoxes weren’t falling where they were supposed to be. Then the scientists realized that the calendar was 11 minutes off every year. Over the course of the centuries these 11 minutes had built up and now the calendar was more than 12 days off. They realized that they had to have three extra days every four centuries. They had to come up with a new calendar convention. Now we have a leap day that we add to some centuries when they turn over into the next century. Three out of every four century turn overs have this extra leap year day. The fact that they figured this out in 1582 I find a remarkable thing. Even this isn’t truly exact. Every once in awhile scientists tell us that we need a leap second. We need these seconds because the length of the year is getting slightly off. There will be an arbitrary glitch in time. An extra second is added or taken away so that the year can equal our rotation around the sun. I’m speaking of these things to draw attention to the fact of how arbitrary time is. It’s all incredibly arbitrary and is merely a convention agreed upon by scientists. Sometimes we do work together. Time and calendars mean nothing in themselves. It’s like the A Course In Miracles Workbook lessons say. We have given everything we see all the meaning that it has for us. The fact that it is a new year means nothing in and of itself, however just like everything else in the world, we can give it a meaning that can be very positive for us if we choose to do so, and why not choose to do that? Why not choose to give every moment a wonderful meaning. This moment of new year is a great thing to celebrate. Eight of us from the Community Miracles Center went down to Pier 14 on the San Francisco Bay, New Year’s Eve night, braving what was forecast as rain. It did drizzle a little on us as we were waiting. We saw the fireworks. We were right there in front of them, as close as one could get, with a totally unobstructed view. They were spectacular. They were synchronized to music. They were great. As I said, there were the questions, “Is it going to rain?” “Is it not going to rain?’ We all watched the weather reports all day. The weather people predicted rain, but it wasn’t raining early in the evening even though it was supposed to be. “Maybe we’ll go anyway, but what if it rains?” We went anyway. It was very interesting. The eight of us went there. It drizzled a little bit before the fireworks. When the fireworks started, absolutely no rain. Absolutely no wind. Brilliant, beautiful, amazing fireworks. Thirty seconds after the fireworks were over, it started to pour. (laughter) It was amazing that the weather gave us a little window to watch the fireworks in. There was a happy expectancy that we frequently feel as the new year approaches. People yell out two minutes to go, one minute to go. Then, with the loudspeakers to guide us, there was a countdown for the last ten seconds, “10, 9, 8, 7, 6, 5, 4, 3 ,2, 1 – Happy New Year!” The fireworks went off on cue at the stroke of midnight. What was even more interesting to me, was the good feeling of camaraderie that existed with everybody that was down there. There were all kinds of people down there. There were young kids. They seemed to be a little inebriated. There were older people. We were standing next to an older couple that told us they had come in from Fresno to spend a couple of days in the city primarily so that they could be down by the pier to watch the fireworks. Isn’t that something? That’s what they wanted to do for New Year’s Eve. Everybody gets to say “Happy New Year” to people. It’s great. We get to celebrate this moment. It doesn’t have any intrinsic meaning in itself. We get to give it some meaning. We get to give it a great meaning. It’s the end of an old year. We accomplished what we did. The world did the things that it did. We did the things that we did. We may have had some challenges over the past year. Hopefully, we’ve learned from them and now it’s time to embark on a new year. A Course In Miracles has some things to tell us when we embark on anything that is new. The Course tells us, “In any situation in which you are uncertain, the first thing to consider, very simply, is, What do I want to come of this? What is it for? The clarification of the goal belongs at the beginning, for it is this which will determine the outcome.” (Tx.Or.Ed.17.58) That’s a very important idea, especially for all of us who are here in the new year. It’s the beginning of something, the beginning of a year of accomplishment. The Course says, “So will the year begin in joy and freedom. There is much to do, and we have been long delayed.” (Tx.Or.Ed.15.112) We’re uncertain what the new year is going to hold. What the Course is telling us is that it is up to us to decide what the new year holds for us. The way that we do this is we decide what this new year is going to be for. It’s our choice. We decide what the goal is. We decide what we want it for and then everything moves in that direction through the decisions that we made. That’s how powerful we are as holy children of God. We are actually manufacturing and manifesting our world, our life, and the lives of those in the world all around us. When I talk about setting goals, especially when I talk to spiritual people, I find that spiritual people like to be rather abstract, general, and lofty about goals. One might ask a spiritual person, “What are your goals for the new year?” They answer, “I have the goals of peace and joy for the new year.” One may ask another spiritual person, “What are your goals for the new year?” The person replies, “I have the goals of abundance and fun in the new year.” Nobody can argue with any of those. People aren’t truly going out on a limb by saying these things. These are pretty safe. We’re all going to say, “Yeah. All right!” However I think that A Course In Miracles actually wants us to be more specific than this. The Course wants us to be more concrete. It asks us to be a little more practical. I think when the Course says, “What do I want to come of this? What is it for?” (Tx.Or.Ed.17.58) The Course is asking us to think a little more specifically and not just of the general, abstract things that we all are comfortable with. A Course In Miracles says, “All miracles mean life, and God is the Giver of life. His Voice will direct you very specifically. You will be told all you need to know.” (Tx.Or.Ed.1.4) There are many times in the Course when it talks about that specificity. We’re going to be specifically told what to do. Here’s another quote for those who think that the Holy Spirits voice is an abstract general one that merely tells us to stay at peace. I think the Holy Spirit’s voice tells us things that are very specific at times. He tells us very specific things to do and when to do them. Holy Spirit tells us very specific things to say and who to say these things to. Holy Spirit tells us very specific places to go and what to do when we get there. “What would You have me do? Where would You have me go? What would You have me say, and to whom? (Wk. Or.Ed.69.11) Those are very specific questions we are to ask and we can expect very specific answers. For me, this is the energy I want for the new year. I think we have been through the lofty. We’ve been through the time of Christ. We’ve been through all those lofty lessons that are at the end of the Workbook. They are so beautiful and poetic, general but great. We all love them. Then we get grounded right back into our day to day with “Nothing I see means anything.” (Wk.Or.Ed.51) “I have given everything I see all the meaning that it has for me.” (Wk.Or.Ed.51) The Course is asking us to start over. For me, that also means starting over with a specific, concrete idea of what my life is, what I have been doing and where I want to go in the future in this new year. One place in A Course In Miracles it talks about having the kind of day we want. It says, “Throughout the day, at any time you think of it and have a quiet moment for reflection, tell yourself again the kind of day you want, the feelings you would have, the things you want to happen to you, and the things you would experience” (Tx.Or.Ed.30.7) This is a very specific asking. It is not just about telling the Holy Spirit that we want a day of joy, peace, and happiness. It’s telling us to get very specific about what specific things we want to have happen to us. I think that the Course definitely says this. It tells us of the general as well. The Course’s teaching encompasses both of those things and I think this time of year is a great time of year to truly get specific about things. What specific things do we want to have happen to us this year? What are our goals? What are the concrete, practical things that we have to do? Here’s another important quote for me, “Sometimes in teaching there is benefit, particularly after you have gone through what seems theoretical and quite remote from what the student has already learned, to bring him back to practical concerns. This we will do today. We will not speak of lofty, world-encompassing ideas but dwell instead on benefits to you.” (Wk.Or.Ed.133.1) This is implying that sometimes A Course In Miracles does speak of lofty world encompassing ideas. That’s definitely in the material. But, every once in awhile, it does want us to get ourselves grounded back into the practical. It’s beneficial to do that especially after we’ve been in the lofty place. It’s beneficial to get grounded back into what day to day life is for us, what our tasks at hand are, and how to proceed with them with the Holy Spirit as our guide. That’s how I like to think of the new year. That’s why I always set goals and resolutions in the new year. I give myself a couple of weeks to do it. I usually like to have it done by the end of January. I actually write them down on a list. I put them down in my iPhone so I can look at them every once in awhile. I do that. I don’t accomplish everything that’s on my list, but it’s great that it gives me a bit of a focus. I feel like I set these goals with Holy Spirit’s help. I think when setting these goals and resolutions it is also important to look at what we already have accomplished. Look back on what has been going on for us in our lives for the past year in a broader sense. In the past few weeks I’ve really been aware of things that I have been doing with A Course In Miracles. This has come up because I’ve been interviewing a lot of new students for our ministry class and they ask me questions. I was asked, “How long have you been studying ACIM?” This seems to be important for them for some reason. I don’t know why because it doesn’t mean much, really. It doesn’t mean mastery of the material. I have been studying the Course since 1980. That’s 31 years. That’s more than three decades. That seems to impress people but it doesn’t actually impress me. I just means I’m old. (laughter) I’m not particularly impressed with that. How I would apply ACIM is much more important question. Sometimes I do well and sometimes I don’t. But, I have been studying it for 31 years. We’re getting ready to start our new class schedule. We teach a class here, it’s the first step of our ministry program, named A Course In Miracles-1. I have taught it and other ministers here have taught it, It’s the regular study of the Text. We read a particular number of pages each week. We go through the book and complete the Text within a year. It’s a lot of reading in the class. The students were asking me, because they were signing up for the class, what the structure of the class was. Sometimes perspective students challenge me a little about the structure of the class because the class is very structured. I say to them. “I’ve been teaching this class with exactly this structure for 24 years. I’m probably not likely to change it.” (laughter) It’s been working for 24 years. The Community Miracles Center will probably keep it this way. It was something for me to take in, 24 years of teaching ACIM-1, going through the book this way, with this structure, dealing with all the things that come up. There are the people who think we are going through the Course too fast. There are people who don’t like to do the homework assignments that they sometimes have to do. I thought about everything that has gone on in that class for the last 24 years. An interesting thing this year that hasn’t happened in I don’t know how long, is that the class is full. I don’t know the last time I had a full A Course In Miracles-1 class. There is a strange miraculous resurgence of interest in the class. I was talking to a Supporting Member. She asked me how the Community Miracles Center was doing. I told her that it was amazing. We’ve had all this interest in the class. She said, “I think you are getting help from the other side.” (laughter) She was referring, of course, to Rev. Larry. Rev. Larry, if you are giving us a little boast – keep it up! It’s great. We have a full A Course In Miracles-1 class. We have a long waiting list to get into that class. We also have three people now in our second level class, ACIM-2, which is the second half of our ministry program. It’s been four years since we have offered that class. There wasn’t anybody interested in it. It’s a very rigorous class that requires a lot of time. Now three people are interested in giving this time and taking this class. This is amazing. We’ve now figured out how to offer it via a telephone conference class and distant projects that we monitor. We’ve worked the details all out. That is happening. It’s a great accomplishment. It gives me something to look forward to in the new year, in the new decade. It looks like there’s a lot of renewed interest in becoming Community Miracles Center ministers. I don’t know where this came from all of a sudden in this new year. We put it out a couple of weeks ago, that our ministry program was starting up again. We had about 45 people email us that they were interested in becoming a minister through the CMC. I’ve been blown away by this – in a good way. Thanks Rev. Larry. 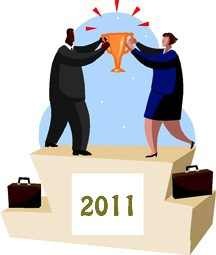 I’ve have a lot of different things that I would like to accomplish in 2011. I also don’t think of these things as being only personal accomplishments. I can look at what society has accomplished and things I want it to see accomplished in society this coming year. Look at what society accomplished in 2010. Sometimes we breeze over these things. We’re much more used to focusing on problems than on achievements. In the last few weeks of the year, the United States government repealed “Don’t Ask, Don’t Tell.” That was an amazing accomplishment. Many of us were in the rush of the holiday. People were doing a lot of things and very busy. I don’t think many had the time to truly reflect on what this was. It ended discrimination of gays and lesbians in the military. Gays and lesbians can now serve openly in the military. They do not have to hide who they are, their identity. This is all part of the ongoing movement of treating everybody as equals, as one. It’s part of that evolution of the world. I think A Course In Miracles tells us this is going to happen. The world is going to get to be a closer and closer reflection of Heaven. Obviously in Heaven, nobody is going to sort out the gay from the straight, the man from the woman, the white from the black, the Muslims from the Christians from the Jews – the you over here from the you over there. We’re all one in the Kingdom of Heaven, in the Reality of Heaven, and the Course tells us that earth and Heaven are going to become such a close reflection of each other that they will cease to exist as separate states. When something like the repeal of “Don’t Ask, Don’t Tell” happens the event is telling me that we truly are healing the world through the work that we are doing. When you see things like this come into the world, I invite you to think that it is an amazing thing. I heard a lot of commentaries about this and the significance of it, because I love to watch my politics shows. A number of commentators said that when you get equality in the military that’s the major hurtle for getting full equality in society. When you know that this person fought with you side by side, and fought for your country with you, it becomes almost impossible to discriminate against them. That happened with African Americans when they started serving equally in the military. There was much greater acceptance of African Americans in the culture when military equality happened. This also happened with woman serving, especially in combat. After that equality happened there was much greater acceptance of women being equal in the culture. Since we’ve already had a lot of acceptance of gays and lesbians in the culture, this repeal will just clinch it. I’m sure gay marriage is not far away even though there is still a conservative backlash movement. Marriage equality is inevitable. Many of the political commentators say this as well. Whether this happens in a year, or two years, or three years we’re going in that direction. There’s no stopping it. This is something that I have for a goal of mine. I feel that I affect the world, not just my personal world but the larger world as well. I have a goal to see marriage equality. I want to see marriage equality happen. It will be a big thing. It’s happened in many states although not in my seeming liberal California. I want to see something that makes marriage equality happen all through the United States. Other things are going on in my life. I’m amazed when I think about this because it is so much different than what happened in the first part of my life. I’ve lived in the same apartment for 27 years. That’s almost half of my life. For the first half of my life I lived all over the place. If I lived someplace for two years that was a long time. I never stopped moving. There was always some reason to move. 27 years ago I moved into the apartment I am in. I had already been studying A Course In Miracles for several years at this time. Gradually something just stabilized. I haven’t moved since. I live in a very modest apartment. It’s very humble and over the years I’ve come to love it. I love where I live. I love my home; it’s very comfortable. I recently got together with my two apartment mates and we have a goal this year to fix up our home in a whole variety of little ways. There are all these home improvements we are going to do. These things are on my goal list for the new year. Just the fact that I have apartment mates who want to do this is miraculous! I’ve lived with a lot of apartment mates over the years who had no interest in the home at all. I have a goal that our conference, that we are having in February, will be very successful. My goal is to get the 400 plus participants that we want. We have 392 right now. I want to get those 400 participants. Even as it is, at 392, we are in the black, but it would be great to break 400. I am holding that as a goal. I have my continued physical health as a goal. I want to continue to exercise. I think that is good for me on a lot of levels. I want to finally finish my will and my estate planning. I’ve been putting that off for a long time. That’s a goal of mine. I want to get all those documents done, signed, filed, and put away. The whole thing when Rev. Larry passed, and what a mess that was, has really taught me something. These legacy issues have to be clear and known. If we do not do this, if we don’t set clear-cut, practical, positive goals at the beginning of the year, our lives will just happen, the world will just happen. We’ll look back at the end of the year and say, “What was that about?” We will make an analysis, and it will be wrong. This is the option we have. We either do this goal setting thing, get practical, or our life just meanders around and probably doesn’t make a whole lot of sense. There are a lot of things that I am goal oriented towards. I know many people think that this is the antithesis of what A Course In Miracles is about. However, ACIM is multifaceted. It’s about many, many things. I want to see the Community Miracles Center run in the black in 2010. I think that this is very possible. We haven’t finished the books for 2010 yet. I don’t know how close we are to actually being in the black yet for 2010. I don’t think we quite made it, but we could be very close. Maybe I’m wrong and we did squeak over into the black. If so, I am willing to be wrong and happy. I definitely want to be in the black for 2011. We’re exploring having a conference in Chicago in 2013. I want that all set up and enrolling heavy by the end of 2011. I am visualizing us in Chicago in 2013. I want our classes to be well attended. I want our ministry program to expand, and it will since we have now figured out how to do this program with people outside of the San Francisco area. I think we are offering a great opportunity and a lot of people seem very interested in it. We finally can do in a nationwide way what we could not do before. I want to see another session of A Course In Miracles-1 taught by somebody else. I don’t want to do another session of this class. There seems to be a strong interest in it. I’m sure one of our ministers will – this is a challenge to them – one of our ministers would just love to do a class. Let’s have two full classes. I want to see a general acceptance that we have an environmental issue on our hands, global warming / climate change and we need to collectively do something about it. I want to see our society, our nation, truly make greater strides towards providing needs for those who are less fortunate: providing more medical care, more basic services for the people who need them. Yes, of course, I want all the general, abstract, lofty things too. I want peace for everybody. I want innocence for everybody. I want love for everybody. I want everybody to know that they are part of an eternal existence. Of course I want all those things, but I want practical down to earth things as well. I think right now as we enter the second decade of the 21st century we should open up that window of opportunity wide, and take the time to set practical goals. Please think about it. Think about what you want in your life. Think about what you want for yourself in the new year. Think about what you want for this world in the new year. You’re part of making this world move in that direction. Get those goals set. Embrace them and let’s charge into 2011 ready to accomplish. This article appeared in the December 2010 (Vol. 24 No. 10) issue of Miracles Monthly. Miracles Monthly is published by Community Miracles Center in San Francisco, CA. CMC is supported solely by people just like you who: become CMC Supporting Members, Give Donations and Purchase Books and Products through us.